During the golden jubilee year of the Chinmaya Movement (2001), land was acquired by Haresh & Lakshmi Lasmana to build a centre in Jakarta. 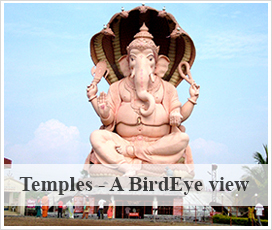 It saw its completion in 2002 with the installation of Lord Ganeshaji, Mangala Vinayaka Bhagwan on Ganesha Chaturthi day in September 2002 in the presence of Swami Mitrananda. Lord Mangala Vinayaka stands 2m tall and about 1.5m wide. The idol made of pancha dhatu (five metals) was sculpted by Pak Nyoman Nuarta whose works grace some of the finest museums in New York, Berlin and Brunei. The official inauguration of the Chinmaya Vidya Kendra was on 4th February 2003 by Swami Tejomayananda in the presence of the Minister of Religious Affairs and the Minister of Tourism. A beautiful stone idol from Bali of Goddess Saraswati graces the entrance. Inside is an altar for Goddess Lakshmi and Goddess Saraswati along with photographs of Pujya Swami Tapovan Maharaj and Swami Chinmayananda. 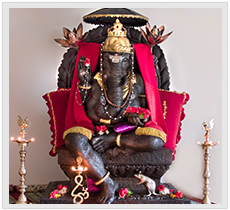 The Mangala Vinayaka temple is in the hall above and Lord Vinayaka blesses one and all.